This month Twipe was present at WAN-IFRA’s Digital Media Europe, Newsfactory’s Newscamp, and INMA’s Subscription Summit.We sensed a genuinely positive vibe, driven by successful premium content strategies from international publishers like The New York Times, or more regional publishers like Dagens Nyheter in Sweden, Russmedia in Austria and BILD in Germany. We summarised our key takeaways from these events, so you don’t get left behind. 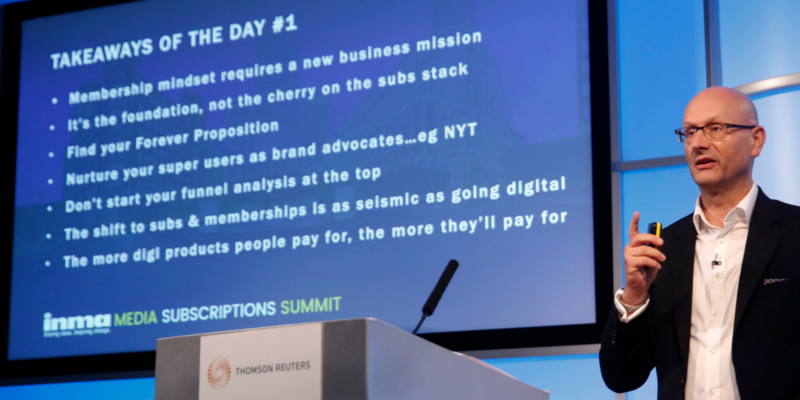 The biggest takeaway from INMA’s Subscription Summit was just how well paid content strategies are paying off for European publishers, with a genuine positive vibe common in all presentations. Most publishers are gradually moving from ‘dumb’ or simple metered paywalls to more sophisticated approaches. With this approach, we see many positive financials: Amedia (Norway) reported 55 million EBITDA in 2017; JPP (Denmark) had their best year since long time; and Helsingin Sanomat has seen their first growth in subscriptions in 25 years. We also learned that BILD earns 16 times more on a premium subscriber than on a free user. Innovative story-telling formats was a key discussion point at Newscamp. Micah Gelman, Director of Video at the Washington Post, and Helje Solberg, CEO of Norway’s VGTV spoke about the successful ways of integrating video into their reporting and to reach audiences. They have seen the necessity of being on different platforms (Snapchat, Instagram, Youtube, Facebook) and are focusing on integrating video content in smart ways. Stories need to be told differently in a long-written format than on Snapchat. The goal of VGTV is to inform, engage, investigate and connect people through video. Newscamp was headlined by industry rock star Mario Garcia. He showed how children’s books and texts should be the standard of story-telling. Those formats are great at including images; describing what is necessary and showing evidence for it. 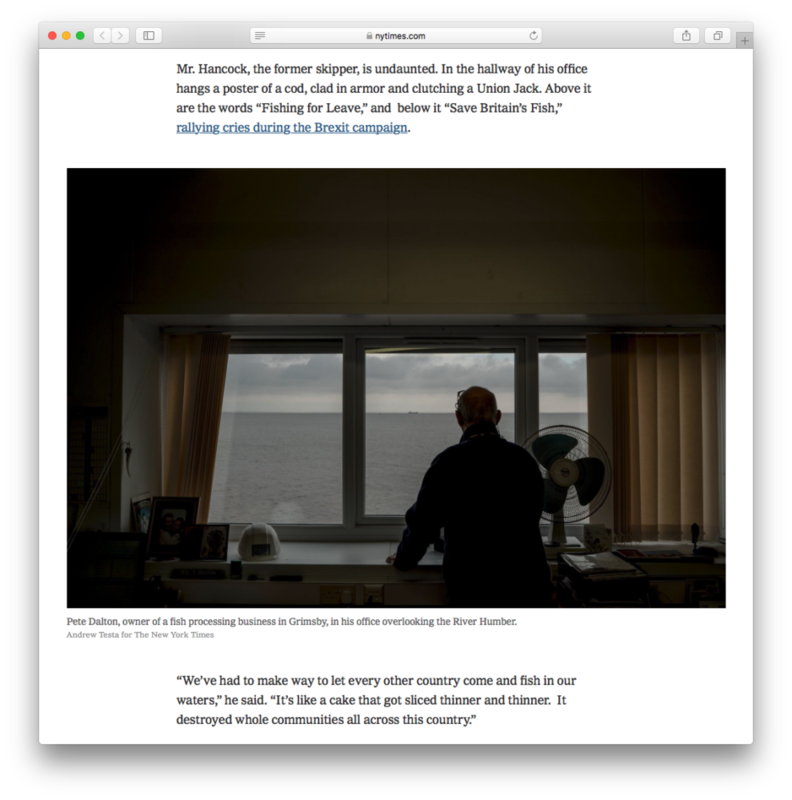 One great example of this comes from The New York Times, in a story on the impact of Brexit on a British fishing village. The article talks about a fisherman in his office, so the lead photo shows the office, which helps the reader understand the surroundings just like a children’s book would. Stories also work differently now. From breaking news that are sent out via a push message right away, 10 minutes later a story might hit your website, maybe a live stream, 2h later a full story gets published, next day in your edition a background analysis. At Newscamp, the ongoing success of ePapers was one of the topics of Gerold Riedmann, Editor in Chief of Vorarlberger Nachrichten and CEO of Russmedia Digital. His opening question to the audience was “How do we build loyalty with the readers?”, which lead through out his entire talk. As only 7% of ‘flyby’ readers can be transformed into paying readers, they worked together with the University of Zurich to create a digital currency for readers to pay with their usage for different games and activities on their news app. This is an effort to help build readers’ daily habits to come back and build loyalty with the brand. He talked about the importance of reaching the right person on the right platform. Riedmann also highlighted the continuing success of the ePaper and branded it as the only digital product that publishers are able to sell in Germany. Our colleagues, Dana Nastase and Georg Aigner, also spoke about Reinventing Digital Editions and the six success factors for newsrooms who want to go the digital-only way. A highlight from DME in Copenhagen was certainly the presentation of Gordon Edall from The Globe and Mail in Canada. He spoke about how they fostered an innovation culture in the organisation in a time of change. They set up an Innovation Lab where they ran a lot of experiments, freeing up anyone from the organisation that wanted to work on a project for a maximum of 90 days. If they weren’t able to figure it out in the 90 day period then they moved on to the next project. One highlight of this innovation culture was their renewed focus on data-driven decision making. They spoke about the importance of embracing data and AI and created dashboards that can be used in the wider organisation, including a tool where they can plot on website articles the engagement versus the acquisition cost, bringing the business element in to the newsroom. This entry was posted in Industry news and tagged Digital Media Europe, Digital publishing, Digital Strategy, Paid Content, subscriptions, WAN-IFRA. Bookmark the permalink.